The original Identity Theft website has moved. If you are concerned you may have had your identity stolen, or have concerns regarding other types of fraud, please visit the new site, Action Fraud. Identity theft rarely involves the unauthorised taking of a victim’s personal possessions, however it does involve the perpetrator of the crime taking the victim’s personal information and then using this in an unauthorised way for their own personal gain. What personal information might criminals take? Any time that a criminal gets hold of a piece of your information, and then uses that information for their own personal gain, it can be considered to be identity theft. Criminals can even use seemingly harmless pieces of information, such as your date of birth, to commit identity theft. Many companies in the United Kingdom will ask you for your date of birth as part of their verification process, so getting hold of your date of birth may enable a criminal to access other information about you. Other information that criminals might take includes; address, email address, previous addresses, mother’s maiden name, the place where you were born, pin number, bank account details, national insurance number and passwords. What can identity thieves do? Once someone else gets hold of your personal information, they are actually able to do a large amount of different things with the information. The most common types of crime are ones which are considered to be financial fraud, such as credit card fraud, bank fraud, tax rebate fraud, benefit fraud and telecommunications fraud. Identity thieves can also use your identity when they commit other crimes, such as entering (or exiting) a country illegally, trafficking drugs, smuggling other substances, committing cyber crimes, laundering money and much more. In fact, they can use your identity to commit almost any crime imaginable in your name. What are the consequences for the victims of identity theft? Although none of the victim’s personal possessions may have been taken, there can actually be a number of large and serious consequences for victims. If a criminal has used another person’s identity to commit a crime, this can put the victim under police suspicion. The victim may find themselves being investigated as part of a criminal investigation, and in some cases they may find it difficult to prove their innocence. People who are the victims of financial fraud can also have a lot of issues come their way. If a person uses your details in any form of monetary transaction, you could end up being saddled with debts. In most cases, if you can prove that the debts are not your responsibility, then you will not be liable for them, however it can also be very difficult to prove that you are not at fault. Even if you manage to absolve yourself of responsibility for the debts, removing incorrect information from your credit score can be even harder. Whilst credit agencies are supposed to remove incorrect information, they often move very slowly when doing so. By the time that the information has been corrected, you may have already been rejected for a number of credit opportunities. Anyone doing a credit check on you in future will then see these rejections, and this may affect their credit decisions. This could make it very difficult for you to get a mortgage, a new credit card or a loan. Some people even have trouble getting a new phone contract once they have a black mark on their credit rating. Most credit agencies will put a notice of corrections on to your credit file, but people who are doing a quick credit check may not notice this. It is therefore important to spot identity theft as early as possible. 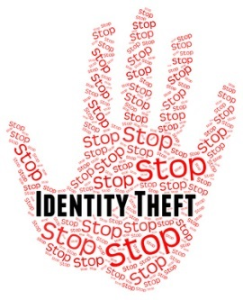 While identity theft is still a serious crime, victims are rarely harmed physically, unless the theft has come as a result of a mugging or similar physical robbery. If you were the victim of a violent crime it is possible that you could have been left psychologically or physically affected (or both) as a result. If this is the case then a victim might have some comfort in the knowledge that they could potentially make a criminal injury claim for compensation. Is it possible to stop identity theft? Methods of identity theft evolve rapidly as new mediums (such as social media) develop quickly, so it is almost impossible to completely prevent identity theft, however it is possible to reduce the likelihood of being a target by taking certain precautions. Take care to protect your data by being aware of your privacy settings on social media. Be aware of suspicious emails which may be phishing for data. Completely destroy all documents containing your personal data, rather than just discarding them with the rest of your rubbish. For comprehensive information on keeping yourself protected against identity theft and other forms of fraud please visit cifas.org.uk.